Oh Fabio Viviani, you sassy Italian chef you, with your adorable quips and charming ways. For those of you who don’t generally memorize television episodes that you’ve seen once, this particular quote appeared in Top Chef All-Stars when Jamie, yet again, chose to sear a scallop. I am the opposite of Jamie in many ways including sexual preference and lack of tattoos, but probably though most notably in my lack of scallop-usage. Until now. 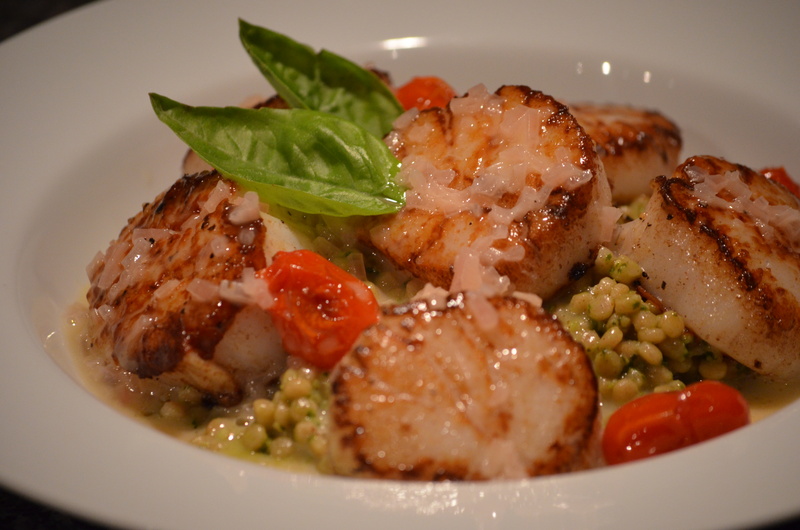 While I am still heterosexual and ink-free, I have recently decided I would like to eat more scallops and so I have been trying them at various establishments in and around town. One of my favorites that I happened upon a few months ago and then again last week is at Wisteria in Atlanta. Rather than venture out, however, I decided we should make them at home. Why not? If the numb-nuts on Hell’s Kitchen can make these (usually), then I can too. (Although I did experience a bit of vicarious PTSD as I could hear Gordon Ramsey’s voice in the background screaming at me to cook them properly as he smashed them with his fist.) Man, I sure watch a lot of cooking shows. I’d say they turned out pretty good for a first attempt at a home-cooked scallop (and despite the sous chef’s inane fear of any stove temperature over 7). 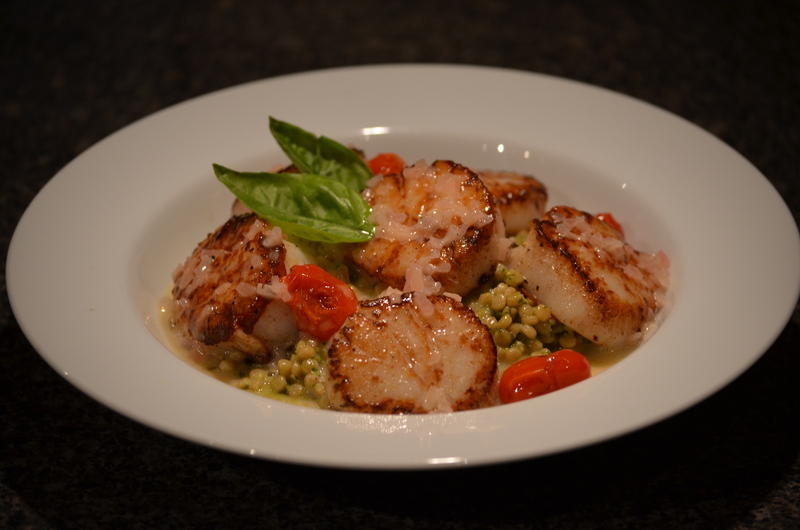 The dish is seared sea scallops with sautéed tomatoes over pesto whole wheat Israeli couscous and a lemon beurre blanc. The best part is – this sounds WAY more complicated than it actually is. The hardest part is probably the timing of getting everything cooked and serving it all hot. The sauce is even forgiving. 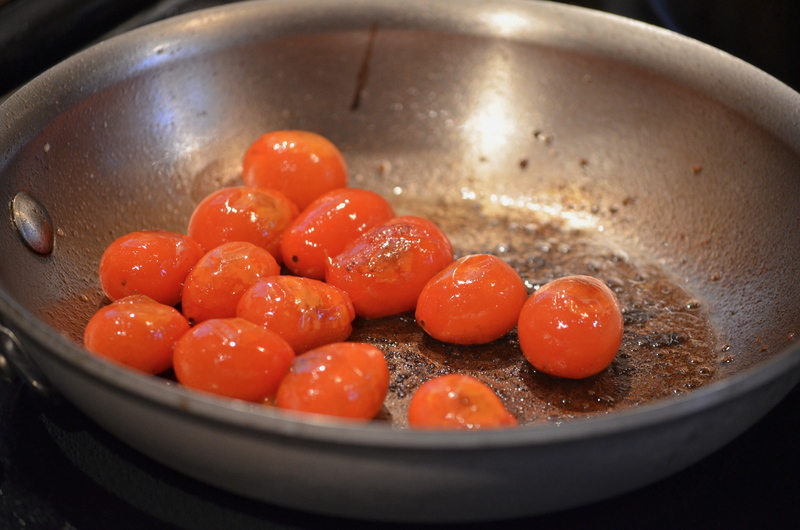 Heat a small pan over medium-high heat and add a bit of olive oil and your handful of tomatoes. Sear for 2-3 minutes until they begin to blister. Set aside. *Disclaimer – I don’t think I cook this “right.” I cook it like pasta, not like couscous and it works fine. The kind I buy is pre-toasted (according to the YDFM label) and I just boil it like I would boil noodles. Please send all of your complaints, in writing, to address below. The couscous can be made 10 minutes or so in advance of everything and just left on the turned-off burner, covered, until you’re ready to serve. The water comes in handy to loosen it up before you serve. To reinforce my bad habits and create an army of ill-informed couscous-cookers, put some water on the stove to boil and drop in 1 cup of couscous and cook until tender. Drain, reserving 1/4 – 1/2 cup cooking liquid. 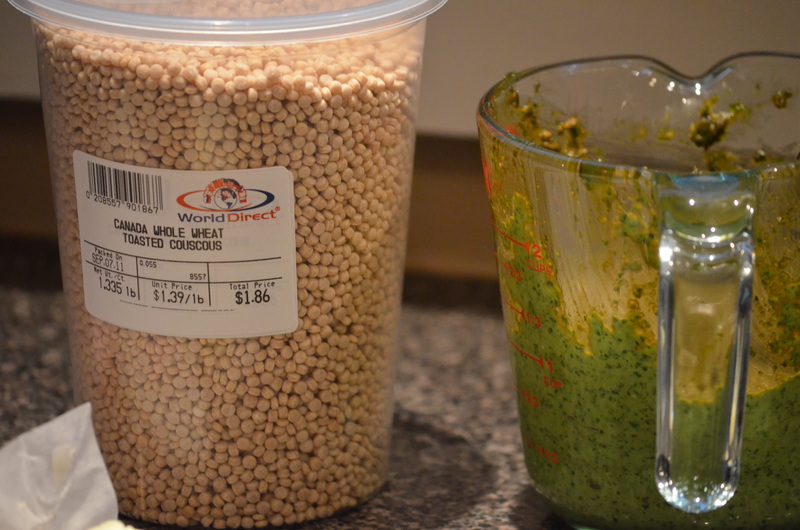 Put couscous back in pot and add 1 tablespoon olive oil, your pesto and enough of the cooking liquid to loosen it up. Stir to combine, turn off the burner, and put a lid on it. This sauce is really forgiving. I even bastardized the recipe and it still held together, so don’t fret. You don’t necessarily need it for this recipe, but I thought a hit of acid/tartness was important to offset the butteriness of the scallops. Heat a small sauce pan over medium-high heat and add white wine, lemon juice and shallot until reduced to about a tablespoon – whisk throughout. Add heavy cream and then turn the heat to low. Whisk in the first 3 tablespoons of butter while the pan is still on the heat. Don’t add in new butter until old butter is melted and emulsified. Pull the pan off the heat and whisk in the remaining butter in the same fashion. Alton Brown then says to keep it in your warm beurre blanc thermos. For those of you who don’t, like me, have a collection of sauce thermii, just cover it and set aside. And now for the main event. The heart-stopping, high-heat-harnessing, smell-up-your-kitchen-for-two-days-with-scallop-smoke, have-your-husband-yell-“turn it down to SEVEN” fun part. Don’t be literal here, a dry scallop means that they aren’t kept in a chemical preservative solution but rather just as scallops in their natural, scalloppy goodness. Google it for more accurate explanation if you please. You’ll need to take off the little muscle on the side of the scallop too before you cook it. I didn’t know what it looked like but it’s obvious once you’re handling the actual mollusk. Trust me. Pat them dry and salt and pepper them. Set aside. Now grab a non-stick skillet and heat it over almost high heat until it’s, well, hot. Add about a teaspoon of butter and a teaspoon of olive oil to the pan and drop in scallops (don’t crowd the pan or let them touch). Cook for 90 seconds on each side and serve immediately. and pretend the couscous was the main course. This is how awesome of a Mum I am… B10 made scallops – all by himself, and informed yelled more than once while cooking “This is TOP CHEF, not TOP SCALLOPS”. He also explained that if they could cook scallops on Hell’s Kitchen, he could cook scallops. It’s sad that my 11 year old assumes (rightly, if you look at many of this HK season’s contestant), that if they can pull it together – he can pull it together… Of course, Gordon is also who “taught us” how to cook Risotto. So you have to circumcise the scalp first? Sounds barbaric and just downright mean. I love it! Of course I have things in common with your boy. The pre-teen, male demographic is really where I relate the most. Miss you, lady! When will we meet again?